Of the various series created by new pulp scribe Percival Constantine, our favorite is his Myth Hunter books starring beautiful Elisa Hill; a trained archeologist who travels the globe in search of arcane artifacts often believed to me mere legends. 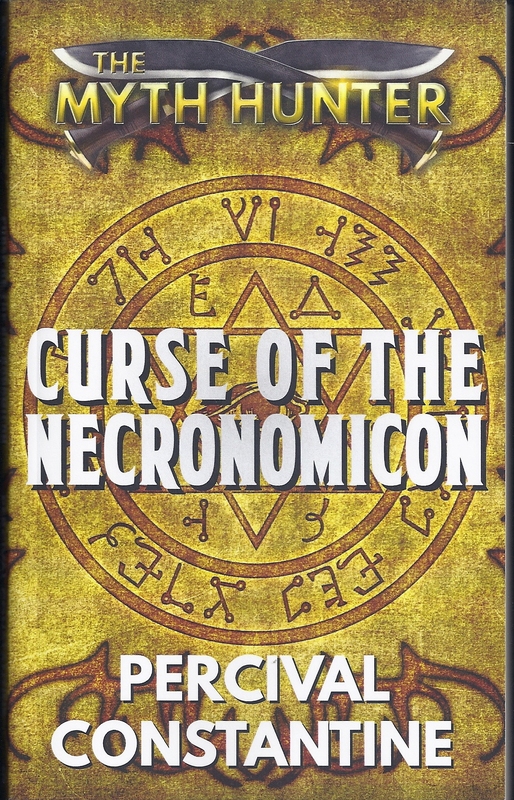 In this latest adventure, Hill, in an effort to save her old lover-partner, Lucas Davalos, finds herself caught up in the quest of the notorious book known as the Necronomicon. First revealed to the public in the horror stories of pulp great, H.P. Lovecraft, the Necronomicon was described as a book of magic which could offer untold powers. The source of thes dark powers were the Elder Gods; a race of monstrous beings banished to another dimension before the dawn of time. A wealthy, recluse financier whose health has him at death’s door, believes the book actually exist and that it can grant him immortality. And so the hunt is on with Hill and Davalos aided by the beautiful Japanese kitsune Asami (a magical being who can turn herself into a kind of were-fox creature) battling an evil demonic cult and army of paid mercenaries to stop a madman from achieving his perverted goals. The action is non-stop as Constantine controls pacing like a fined tuned Ferrari engine whipping through delightful character scenes with just the right moments of personal tension. We’ve said all along that Constantine just gets better with every new book he writes. 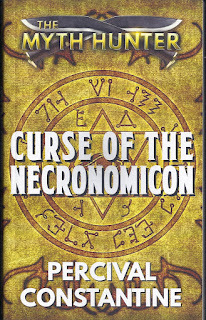 “Curse of the Necronomican” continues to prove us right as it has become our favorite Myth Hunter entry thus far. If you enjoy great pulp adventures with gutsy female heroes, look no further, dear readers. This one’s for you. The traditional classic pulp novels that appeared in the 30s magazines generally ran 60,000 words. In them one would find a fast paced narrative that would explode across the pages in colorful, purple prose. Over time many of these tales were reprinted in paperbacks and continued to be labeled as novels. Whereas in truth, they were actually novellas that once took up the main portion of a monthly periodical that also featured two to three additional shorts to fill them out. We raise this topic because over the years, most novels coming from the big New York publishers grew to well over 120,000 words and were easily distinguishable from their pulp paperback cousins. Of course this ultimately led to the over-written, padded monstrosities we are cursed with today and the dwindling sales margins have forced big time publishers to demand “bigger” books. But that’s a whole other topic for another time. Our purpose here was to point out that the fact that even with the emergence of New Pulp, writers found themselves sticking with the tried and true 60,000 word format which isn’t a bad thing at all. Whereas a few daring penmen have attempted to bridge the gap between pulp and traditional novel and the results have been haphazard to say the least. Up until now no one had been able to deliver a realistic hybrid we are hereby calling the pulp novel. And that, my fellow dear readers, is what John Bruening has brilliantly achieved here. “The Midnight Guardian – Hour of Darkness,” clocking in at twice the size of an average pulp book is a genuine novel in every sense of the word….and still pulp. The significance of that is going to felt for a long time to come. When Jack Hunter was a young man of high school age, his policeman father, Lt. James Hunter, died heroically saving Union City from a sadistic gangland boss named Nicky Diamond. Diamond was caught and sent to prison for fifteen years, while young Jack went on to college and eventually law school. The plot kicks into high gear when Diamond, upon his release, returns to the city and immediately begins setting up his old gang He recruits new soldiers with the intent of finally realizing his twisted dream of taking complete control of Union City. Whereas Jack is now an Assistant District Attorney who, along with his boss, the police Commissioner and a dedicated police detective named Dugan, is not about to let that happen. The added menace in Nicky Diamond is that he loves to blow things up and hires both a demolition expert and a talented radio engineer. Together he has them fashion deadly timebombs which he uses in leveling several buildings with the city limits. These acts of destructions are his public calling card announcing his return. Angered by Diamond’s effrontery and total disrespect for the law, Jack finds himself stymied in not being able to go after the crook directly. The memory of his father’s death continues to haunt him and his temptation to make this crusade a personal one is at constant struggle with his career as a representative of the justice system. Eventually, it is Jack’s cousin, Buzz Hunter, who offers him a fantastic alternative to his dilemma. Eight years older and a veteran of World War One, Buzz owns and operates an electrical store and is himself a genius inventor. It is Buzz who creates a leather helmet wired with special sensors that when worn, affect a stimulating wave that heightens the brain’s sensory capabilities. Simply put, when one wears the helmet, one can hear and see far beyond the normal human range. Adding goggles and a mask to the helmet, Jack ends up with a remarkable scientific marvel that helps him gain an edge on Diamond and his murderous crew. Wearing the disguising helmet and whipping through Union City on a souped-up motorcycle, Jack becomes a mysterious vigilante and begins his campaign to thwart Diamond and his insane goals. If all this sounds familiar, it’s because Bruening has no issue with following classic pulp elements to weave his over-the-top adventure and he gives us a new pulp hero who is truly a legitimate heir to such battlers as Secret Agent X and the Black Bat. By the time we had come to the novel’s last fifty pages, all this reviewer could do was keep turning pages and hang on tightly. Every single action sequence that races towards the dramatic finale is a Republic Serial put to prose. There is no lack of action in this tome, and even though Bruening does give us a larger entree than we are use to, he makes it so damn tasty; it becomes a remarkable pulp feast. 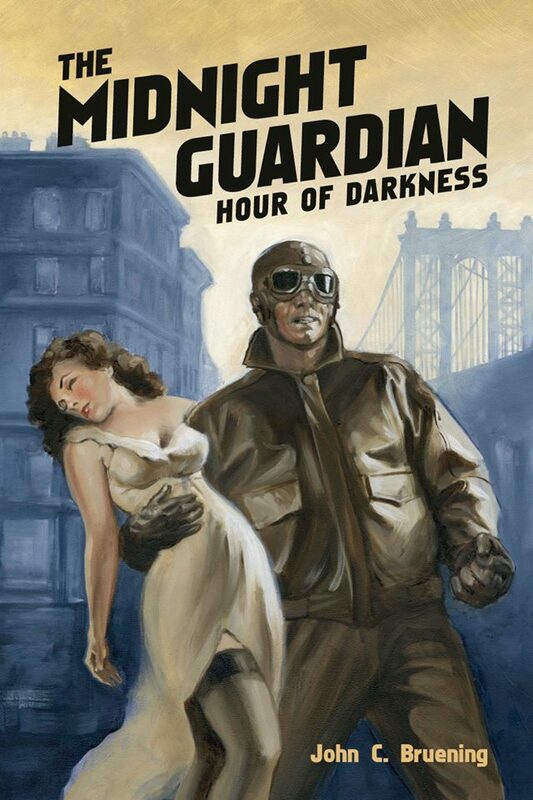 “The Midnight Guardian – Hour of Darkness” is a pulp novel. As such it is the first of its kind, and this reviewer has to believe, having now set the bar to this quality level, Bruening’s colleagues have one hell of a challenge ahead of them. We wish them luck.